St. Martin's Griffin, 9780312377809, 144pp. In our hurried times Crafting Fun introduces kids to classic childhood crafts that many of us remember fondly. The charming vintage art illustrating all the projects adds to the appeal and the hidden-spiral binding with a sturdy paper-over-board cover makes the book easy to use. 101 easy and entertaining projects are explained on one to two pages each. Make a pumpkin-seed necklace or crayoned waxed leaves for fall, decorate with paper-cut snowflakes during the winter or make a summer scrapbook of pressed flowers. The step-by-step directions and line drawings allow even the youngest crafter to follow along. The seasonal activities also include fun facts relating to the projects, like how to tell a ghost story, charts of state trees, and the names of the first Thanksgiving attendees. HOURS OF ENTERTAINMENT---projects and activities are organized by season to provide year-round activities for children, parents, and teachers. SIMPLE FUN PROJECTS---from creating glittery holiday decorations, to making tin can lanterns, kites that really fly, or spooky cheesecloth ghosts, the book is filled with projects with an old-fashioned slant. RECYCLE BASIC HOUSEHOLD ITEMS---most of the projects use simple materials found in every home, such as aluminum foil, string, paper bags, egg cartons, and others. FOR YOUNGER CHILDREN ALSO---many of the projects can be done by younger children with adult supervision. For parents, grandparents or teachers, this lovely book will help create fond family memories and provide a plethora of fun projects and activities. RAE GRANT is a book designer, collage illustrator, and author. Her background in fine letterpress printing and bookmaking established her reputation for designing high-quality illustrated books. Rae lives in Manhattan with her daughter and husband. 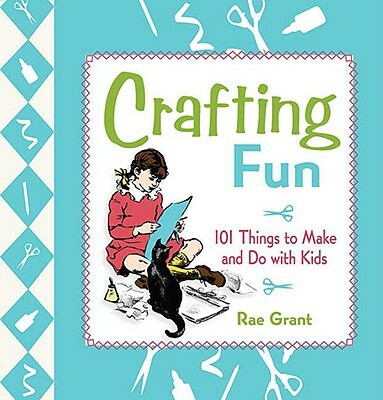 "Crafting Fun: 101 Things to Make and Do with Kids by Rae Grant is a hands-on, hands-down winner and the perfect book for National Craft Month. The binding makes holding your place as you prepare to craft a breeze. Projects are simple and straightforward, and will entertain your children for hours. Organized by season, crafts such as a Pumpkin-Seed Necklace, a Snow Globe, Glitter Pinecones, Sponge-Painted Eggs, Mother’s Day Potato Print Cards and a Fourth of July Confetti Blower will keep your kids crafting through the months. The book’s Animal Track Casting craft has me inspired for my next family hike. A lot of these crafts aren’t new, but it’s handy to have them all together with useful step-by-step instructions in one beautifully designed book. If you like the format, check out the companion book, Cooking Fun: 121 Simple Recipes to Make with Kids, also by Rae Grant."